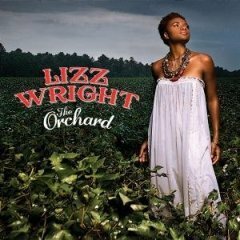 From its first track’s atmosphere of lean Hammond B3s, hollowed-pit drum snaps, gristly wah-wah-infused guitars and dusty pedal steel, you can hear that Georgia crooner Lizz Wright’s moved from the R&B rub of previous recordings (Salt) to a different street entirely: Craig Street’s street, he the producer behind the crusty textural vibes of Cassandra Wilson. This is no shock. Wright’s baritone husk has always sounded like a sprightlier version of Wilson’s carefully odd wail. But Street and a cast of characters-including singer Marc Anthony Thompson and pedal/mandolin player Larry Campbell-drop Wright’s soul-strewn highs to encompass rangy blues numbers penned by Ike Turner (the greasy-lite of “I Idolize You”) and handily emotional ballads by Mel Tillis (a yawning, spacious “Strange”) and the Page/Plant team (a weirdly smooth “Thank You”). Beyond Street and his oozing, ambient glue, Wright’s true Orchard soulmate comes in the guise of acoustic guitarist/composer Toshi Reagon. Along with nasty six-string licks and connecting the dots of her own past to the present day (her gospel-y mom Bernice Johnson Reagon wrote “Hey Mann”), Reagon provides Wright with songwriting collaboration the likes of which bear fruit dramatic (that aforementioned first track “Coming Home”) and desire-filled (“Leave Me Standing Alone”). It’s not as if Wright can’t write. She has on previous outings. But Reagon offers up some persnickety stuff, little crevices of melodic nuance, that Wright decidedly needs to challenge the smooth acuity of her voice. Let’s hope they continue the partnership.